I keep hearing from folks who have a summer bucket list. And I’ve done that in the past. It’s fun. Especially if you have a cute picture (like this one from Lindsey over at Pen and Paint) to add your list to! But what I’ve done in the past is try to think of all these amazingly outstanding things that honestly, end up being a lot of work… so I don’t do them. This year, my summer bucket list is MODIFIED. And so far, the kids are loving it! It’s all about finding activities we already have that they haven’t done in a while, or using dollar store items to try something new and different. Right at the end of the school year, we made glitter playdoh in two colors. It still hasn’t lost its sparkle, or its excitement. When it does, we’ll take a break for a couple weeks, and then make some in new colors! I got some little toy boats from Dollar Tree that will be another water table outside modification. They also love it when I let them play in cheap shaving creme – which would be another fun outside water table activity – where it’s easy to hose them down when they are done! They are still enjoying Gray’s new garden table (affiliate link, thank you!) that my parents got him for his birthday, so it hasn’t lost it’s novelty yet. If you don’t have an outdoor activity table, this is one to consider because it can double as a sand/water play station, or they can simply pretend they are gardening! I re-organized our kid movies and we’re going to watch a different movie that we already own each week as a family. We’re discovering new recipes on Tasty Junior that we want to try. My next big goal is to clean out/reorganize our activity closet – and I’m sure we’ll find all kinds of fun things we haven’t played with in a while. The other day, Becca rediscovered her love of Castle Logix (affiliate link, thank you! ), and has played it several times. She even asked to move it to her room so she can play it in there! Grayson is now big enough to enjoy our Animal Habitat Boxes, so I plan to pull those out – a new one every couple of weeks – and let him explore (and Becca can re-explore). He is also big enough now to start building more complex train tracks, so I plan to play with him (and Becca) to make some of our family name tracks like we did with Becca last year. We have a bunch of puzzles in the family room – my goal is for us to work one each week. Yes, we’ll take a weekly trip to The DoSeum and Sea World, and a monthly trip to the zoo, but this summer isn’t going to be all about going places – it’s going to be about enjoying and exploring AT HOME. I feel like our kids get so stuck on going places and doing things that they forget how much fun we can have at home!! So while two days out of the week we’ll be going somewhere, I plan to have lots of fun at home the rest of the time! I do plan to take one big, fun trip out and about – to have both kids paint at Painting With a Twist! Did you know that they have “all ages” paintings that are perfect for kids? Becca has loved painting there in the past, and I’m ready to take the plunge and let Grayson try it as well! (I’m thinking I’ll get some adorable pics of him painting in his diaper…;) Note that while each painter is a $35 fee, they frequently do drawings and giveaways on their Facebook page, so you should follow them to possibly earn your painting trip for FREE! If you like this idea, but you’re just not sure where to start on activities without spending a ton of money buying stuff, you really should consider getting THIS BOOK – Raising Creative Kids (affiliate link, thank you! 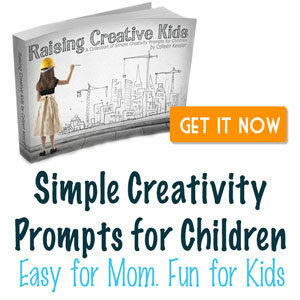 )– my friend Colleen has done a wonderful job of compiling ideas to get you AND your kids thinking creatively! I plan to pull it out at least once a week and set up challenges for the kids! I would also challenge you to go through closets, book shelves, and boxes in the attic – find things that you think your kids are done with… and recycle them! Find new ways to entertain them with those activities. Or if they are simply way too young for your kids, stick them in a box for your next local consignment sale and turn them into cash! Your summer bucket list could MAKE you money instead of costing you money! Just keep in mind that the summer shouldn’t be all about ONE thing. It’s not all about sitting in front of the tv. It’s not all about going somewhere new every day. It’s not all about swimming every day. It’s about BALANCE. A good, wide variety of activities that don’t have to be expensive, or take you away from home. Author travelwchristyPosted on June 7, 2016 June 7, 2016 Categories Animal Habitats, Play Dough, Sensory Bins1 Comment on Summer Bucket List… Modified. Happy Valentine’s Day!! If you’re like me, this day has snuck up quickly – quicker than usual, it seems. And somehow I recently realized that I haven’t made any play dough since Christmas. Yeah. We go in phases of play around here, and we’ve been out of a play dough mode for a while. But, Becca’s been asking for some, so I thought I’d make her a wonderful surprise and make glitter play dough! So, I looked online at a million different recipes and decided that I guess I’m just lazy. Or maybe I’m stuck in a rut. But whatever it is, I’m just not willing to try a new play dough recipe. I like mine, and I’m stickin’ to it! Maybe you’ve been looking for an EASY recipe, too. So many of them require the stove or an electric skillet. And honestly, this was the first time I made my recipe without the electric skillet, and I felt so silly that I had ever used it in the first place!! 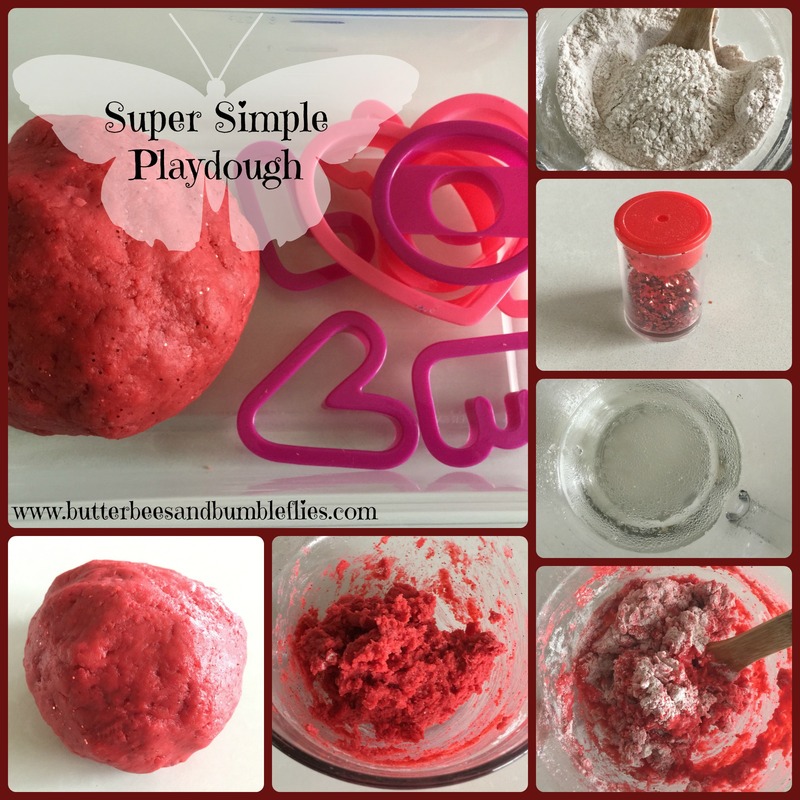 Here’s what you need to do to make my Super Simple Playdough. In a bowl, mix together 1 cup of flour, a little less than 1/2 cup table salt, 2 tsp cream of tartar, three packages of your favorite Koolaid for vibrant color (I used cherry for this to make it red. Fyi though, if you do grape wanting to make purple, only use one pack b/c three comes out almost black), and then if you want, stir in some glitter, too. In a larger mixing bowl, heat 1 1/4 cups water and 1 overflowing Tbsp of vegetable oil. Make sure it’s boiling when you pull it out – I heated mine for 3 minutes. Dump in your dry ingredients and stir well. You’ll have a sticky mass in your bowl. Let it cool for about an hour. Then it’s ready to be played with! No adding extra flour or any stovetop mess! Super simple. Store it in an airtight container, and it’ll be great for play for a couple of weeks. After that point, you’ll need to add flour if you want it to not be sticky… or just throw it away and make a new color/scent! NOTE: If you don’t have any Koolaid on hand, food coloring works just as well – add it to the boiling water. You can add a drop of essential oil to the water for a scent if you’d like. If you have a child who is eager to dive in and doesn’t mind the CAUTION – HOT! dough, you can throw a little flour on the counter and let them go ahead and dive in to kneading the dough as soon as it is mixed!